Healthy Breakfast Frittata Recipe from Suga! ● Preheat the oven to 400°F. ● Spray skillet with cooking spray and set aside. ● In a bowl, whisk the eggs, salt, a dash of black pepper, 1/4 tsp. oregano and almond milk/skimmed milk. ● Add chopped escallion, tomato, cooked callaloo and half of the cheese. Stir, then whisk to combine mixture. ● Pour mixture into prepared skillet and sprinkle the other half of the cheese on top. ● Bake for 15-20 mins, then remove from oven and allow to cool for 5 mins. 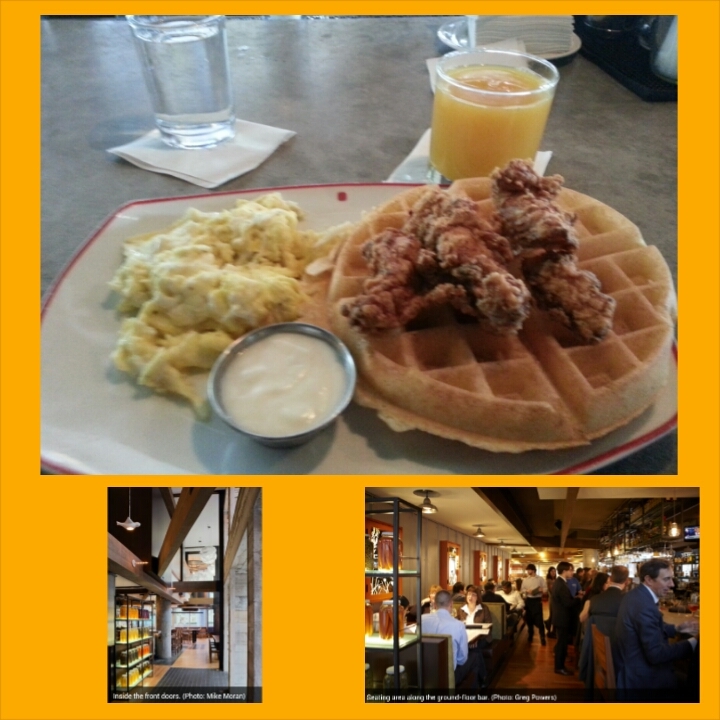 Gabby goes to Founding Farmers for Breakfast, just 3 blocks away from the White House! After a late night in the DC streets 2 weekends ago, I was ready for some grub in the morning. My brother picked the perfect place, Founding Farmers, just 3 blocks from the White House where we would go sight-seeing afterwards. The place was filled with people, like The Cheesecake Factory lines to get a table. But apparently they have just started giving the option of making reservations. We didn’t know that, so just decided to wait until spots by the bar were vacant, since that would be quicker. Sitting by the bar didn’t look much less comfortable than booths or tables. It seemed cozy nonetheless. The two-story restaurant had old, wooden, farm table decor mixed with modern crafted elements throughout. It was a beautiful day with the sunlight flooding through the glass windows, highlighting various features and finishes of the designs by award-winning CORE architecture and design. I ordered a Hot Chocolate immediately, which was divine. Then I ordered the Farmer’s Fare that consisted of Breakfast Chicken & Waffles with a side of Eggs anyway you liked it, white gravy and syrup. Despite the more than ‘full house’, my breakfast arrived quickly in less than 10 minutes and at a glance, I was salivating. Then the taste, mmmm. The Waffle was so big and thick, but light and fresh. The Scrambled Eggs were fluffy topped off with that Farm Fresh Fried Chicken. The Breakfast Fare was just $12USD, which was more than worth it. My stomach was full and satisfied. I mean, it was just typical ‘Breakfast food’ right? But it was so delicious. 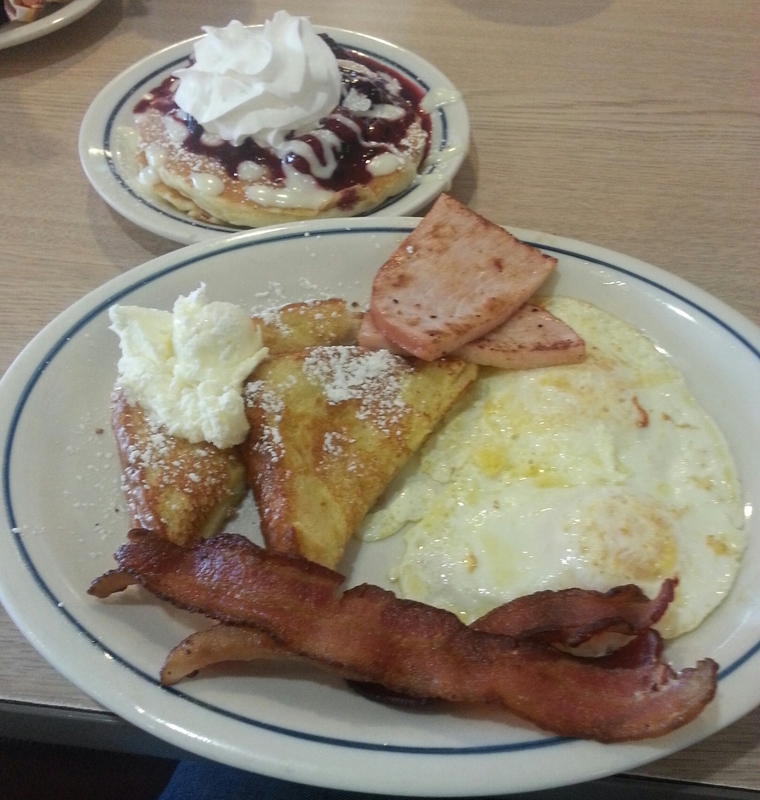 IHOP and Waffle House what?! It was also a delight to experience such great service in a busy atmosphere. Heading to DC or the US Capitol anytime soon? Founding Farmers is a MUST STOP for Breakfast. Can you imagine they are practically open all day for lunch and dinner too?! Can’t wait to revisit and try those menus. The award-winning Founding Farmers is also located in Montgomery County, Maryland and will soon be adding a new location in Tysons Corner, Virginia this fall. They have various Certifications showing that they are dedicated to environmentally friendly practices, including being a Certified Green Restaurant. Their products are sourced from local farmers with seasonal menu changes to always contain local produce. For more information, visit http://www.wearefoundingfarmers.com. Founding Farmers True Food and Drink, Washington D.C.